Can travel insurance be cool? No. Travel insurance is, by its very design, one of the more resented aspects of travel. We complain about buying it, and when it expires, we complain that we did. But there’s one travel insurance company which has drawn a line in the sand, embraced the travel community and celebrated the movement. World Nomads travel insurance have continued to encourage travellers of every age, to ‘Keep Travelling Safely’ and this July they’re about to crank things up another level. The World Nomads team have really burst out of their suits this season, with the launch of their Travel Documentary Scholarship. The successful applicant will be thrown into the Amazon with a professional documentary maker, Trent O’Donnell. And then. When all is sweat and done. Your documentary will be considered for screening on Nat Geo Adventure to be seen by (almost) the entire world. These opportunities don’t come along very often, so I if you’re a fan of film in any way, shape or form, I implore you to look into it. Cough, cough. Best newsreader’s voice please: In other news, World Nomads popular Van-Tastic adventure is rolling up to the curb. For the best part of nine months, seven drivers and shotgun riders have taken Geoff (the garish campervan) around the world’s largest island continent, Britain. No wait, Australia. Australia is apparently larger than Britain. They’ve travelled over 33,000 km across 6 Australian states and one dusty red territory. For the socialites amongst you, they’ve scored over 47,000 views on YouTube, 45,000 views on their blogs and 47,000 views on their photos. They’ve farted on the seats, shagged in the cab and burned pasta on the hob and now they’re on the hunt for votes. The winning team will receive $10,000 and flights from Virgin Blue, and one lucky voter — this is quite incredible — will win the ultimate roadtrip adventure pack, valued at $5000AUD (including an iPod Touch, $100 voucher iTunes, MacBook Pro 15’, iPhone 32GB, Canon Legria HF20 video camera, WorldNomads.com adventure travel kit). 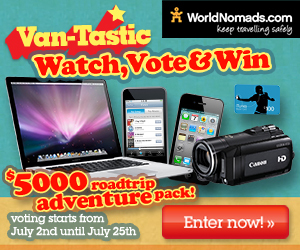 Vote for your favourite team from July 2nd to July 25th on the Van-Tastic Adventures homepage and go in the draw to win. Give the entrants their due. They’re individuals and teams who grasped the opportunity of a lifetime, took on a project that would test them to the limit of their skills and beyond. While I’m confident they all had the time of their lives, they’re all in it to win it. But who deserves it the most? Were you aware of the Van-Tastic adventure? Or perhaps I just highlighted a travel documentary scholarship that could change your life — how would you use it? Am I an affiliate of World Nomads? Yes. I offer my readers a beautiful 7% off World Nomads travel insurance policies with the World Nomads promo code, TRLANT. Does that influence the post? Not in any way, shape or form. You just goes to show you don’t have to go halfway round the world to have a fun travel adventure. You just have to have the right attitude.